Pope Francis will publish an encyclical addressing environmental issues and climate change this Thursday, a subject that continues to deeply divide Americans, including Catholics, along partisan and ideological lines. Overall, Americans’ views about whether the earth is warming have remained relatively stable in recent years, with about two-thirds of the public (68%) currently saying there is solid evidence that the average temperature on Earth has been getting warmer over the past few decades while 25% say there is not solid evidence of this. Even so, a new Pew Research Center survey finds that there has been a significant uptick over the past two years in the share of Americans who say global warming is a very serious problem. 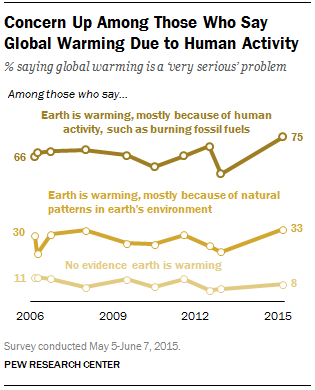 Currently, 46% say that global warming is a very serious problem, up 13 percentage points from the spring of 2013. Partisanship and ideology remain some of the strongest factors underlying attitudes about whether Earth is warming, our survey finds. Today, roughly nine-in-ten liberal Democrats (92%) say that there is solid evidence Earth’s average temperature is rising, and 76% attribute this rise mostly to human activity. 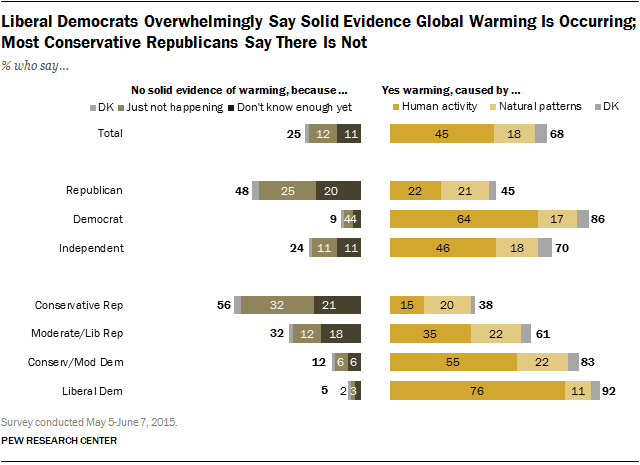 Very few liberal Democrats (5%) say there is not solid evidence of warming. A clear 83% majority of conservative and moderate Democrats also say Earth is warming, but just 55% say this is the result of human activity. By contrast, just 38% of conservative Republicans say that there is solid evidence of global warming. Reflecting a divide within the GOP, conservative Republicans stand out as the only ideological group in which a majority (56%) says that there is not solid evidence of a rise in the earth’s temperature (a 61% majority of moderate and liberal Republicans say Earth is warming). Although these deep ideological divides over global warming are not new, views about the significance of global warming as a problem continue to diverge. Just 14% of conservative Republicans say global warming is a very serious problem – a share that has remained unchanged in two years. 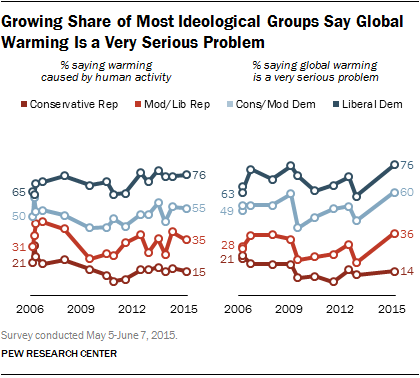 But since 2013, the share of those who say global warming is a serious problem has increased among liberal Democrats to 76% (up 19 points), among conservative and moderate Democrats to 60% (up 17 points) and among moderate and liberal Republicans to 36% (up 17 points). Those who say global warming is happening as a result of human activity increasingly believe that it is a very serious problem: Today, fully three-quarters (75%) say this, up 17 points from 2013. And although just 33% of those who attribute warming to natural patterns in the earth’s environment say it is a very serious problem, that reflects a 10-point increase since 2013. Among those who say there is no solid evidence of global warming, just 8% say global warming is a very serious problem, unchanged since 2013. Views of the seriousness of global warming also vary by gender, race, age and education. Women, Hispanics, younger people and those with college degrees are more likely to identify global warming as a very serious problem. See a detailed breakdown of these questions by additional demographic groups here.